Terraza Mar Sun Suite Complex Apartments, Puerto Rico, Gran Canaria Free Child Places Low Deposit Family Holidays @ Web2travel Deals. Finding the Best Value Holidays to Gran Canaria from UK airports. Terraza Mar Sun Suite Complex Apartments were formerly called Terraza Mar Apartments. The property is also called Aparthotel Servatur Terrazamar Suites by some Tour Operators. The complex is situated on a hillside just 200m from Puerto Rico’s waterpark, 300m from the shopping centre and just over 1km from the beach. Please note: Due to its hillside position there are a number of steps in and around Terraza Mar. Built over a series of levels overlooking the resort, this complex offers quality accommodation and facilities for all its guests. One bedroom apartments are suitable for up to 3 adults and 1 child, and are equipped with a private shower-room, telephone, a balcony or terrace and a kitchenette with two cooking rings, microwave, cooking utensils and a fridge. TV, safety deposit boxes and air conditioning are available for a local charge. PLEASE NOTE: The accommodation can be placed in any of the buildings making up this complex, Sun Suite and Terrazamar. 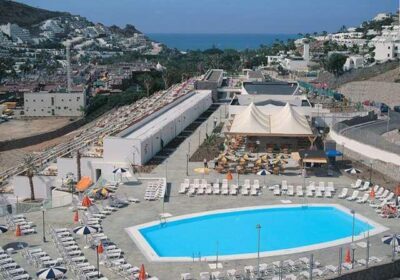 The complex has heated swimming pools, wide sun terraces with sun beds and parasols, a poolside bar, a restaurant and a lounge bar. Other facilities include tennis and squash courts, billiards, table football, ping-pong, slot machines, childrens playground, mini-market, reception with currency exchange and internet corner (local charge), self-service laundry and parking.